Reading, one of the most difficult activities for children with dyslexia, can be improved by the use of green filters. A study described in an article by Brazilian and French researchers reports increased reading speed for nine- and ten-year-old volunteers with dyslexia who used green filters. The filters had no effect on age-matched children without dyslexia. Colored filters for the treatment of learning disabilities were first patented in 1983. They were also designed for use by children with autism and attention deficit hyperactivity disorder (ADHD). "However, studies of their efficacy were methodologically flawed. We used a highly rigorous methodology for the first time," said Milena Razuk, first author of the article, published in the journal Research in Developmental Disabilities. The filters are not widely used in Brazil owing to a lack of research, although they have been adopted in some countries, such as France. Razuk, who completed her PhD in April at Cruzeiro do Sul University (São Paulo, Brazil), performed the experiment while in France on a research internship at Paris Diderot University (Paris 7), with support from the Sao Paulo Research Foundation – FAPESP. Eighteen children with dyslexia and 18 without dyslexia were selected for the study at Robert Debré Hospital in Paris. The researchers decided to use yellow and green filters in the experiment. "Twelve colors are available, but we chose two because a very long test would be too demanding for the volunteers," said José Angelo Barela, a professor at São Paulo State University's Rio Claro Bioscience Institute (IBRC-UNESP) in Brazil and principal investigator for the project. All 36 children were asked to read passages from children's books suited to their reading age. The texts were displayed on a computer screen with a yellow filter, a green filter, and no filter. 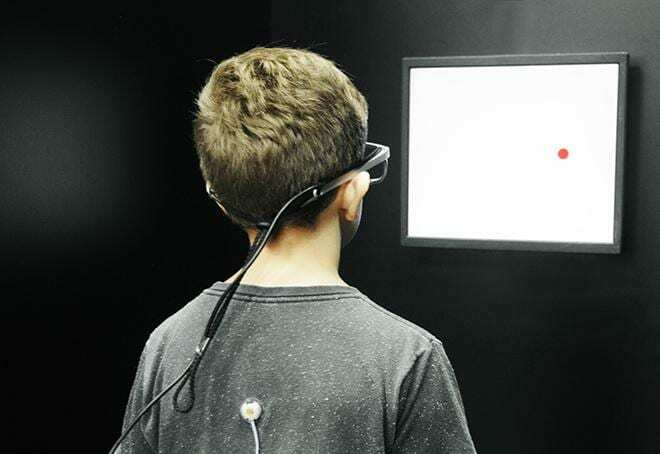 Their eye movements were recorded with the Mobile EyeBrain Tracker®, a French eye-tracking device certified for medical purposes, consisting of goggles fitted with cameras that record the movements of each eye independently via infrared light signals. "A child with dyslexia has to fix his or her gaze on the words for a longer time to understand a text. Reading speed is slower as a result," Barela told. While the filters did not affect reading speed for the children without dyslexia, the eye-tracking device detected a statistically significant difference for children with dyslexia, who read fastest with the green filter, fixing their gaze on groups of words for 500 thousandths of a second, compared with 600 thousandths of a second using the yellow filter or no filter. The fixation period with or without filters was 400 thousandths of a second for children without dyslexia. The authors of the study stress that they did not evaluate whether the use of a green filter improved comprehension of what was read and that further research is needed to explore this dimension. Extensive testing has shown that neither impaired eyesight nor intellectual deficiency is part of the condition. "IQ must be normal or above average for dyslexia to be diagnosed," noted the FAPESP-supported researcher. In the article, the authors of the study say the improvement in reading time with the green filter might be due to changes in the visual stimuli available for central nervous system processing. Other studies have suggested that colored filters may reduce cortical hyperexcitability in the brain, which may be greater in dyslexic people, thereby attenuating contrasts in visual stimuli and hence improving reading performance. This suggestion was reinforced by a 2015 study in which functional magnetic resonance imaging (fMRI) showed significant activation of the cerebral cortex during reading with colored filters (mostly blue in this case) compared with reading without filters. The authors hypothesized that the filters reduced visual stress and distortion, enhancing visual processing and reading performance. The next step for the group at IBRC-UNESP will be to use fMRI scans to analyze the brain activity of dyslexic children while reading. Barela has purchased an MRI machine with funding from Brazil's National Council for Scientific & Technological Development (CNPq).